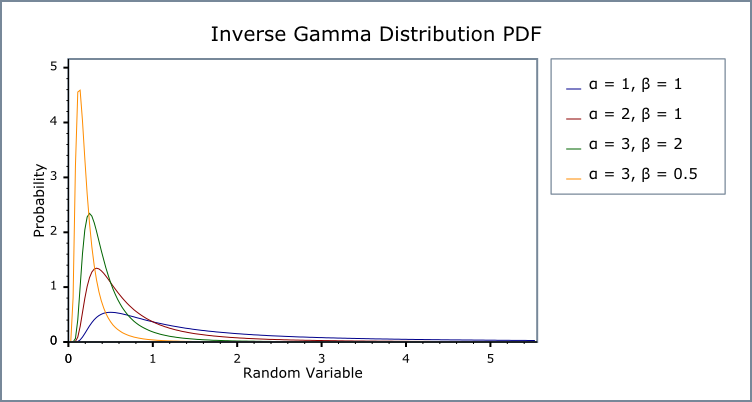 The inverse_gamma distribution is a continuous probability distribution of the reciprocal of a variable distributed according to the gamma distribution. The inverse_gamma distribution is used in Bayesian statistics. 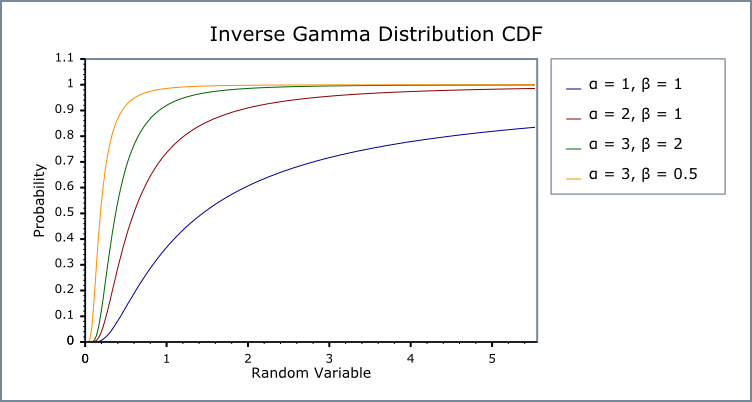 R inverse gamma distribution functions. Constructs an inverse gamma distribution with shape α and scale β. Requires that the shape and scale parameters are greater than zero, otherwise calls domain_error. Returns the α shape parameter of this inverse gamma distribution. Returns the β scale parameter of this inverse gamma distribution. The domain of the random variate is [0,+∞]. Unlike some definitions, this implementation supports a random variate equal to zero as a special case, returning zero for pdf and cdf. The inverse gamma distribution is implemented in terms of the incomplete gamma functions gamma_p and gamma_q and their inverses gamma_p_inv and gamma_q_inv: refer to the accuracy data for those functions for more information. But in general, inverse_gamma results are accurate to a few epsilon, >14 decimal digits accuracy for 64-bit double. In the following table α is the shape parameter of the distribution, α is its scale parameter, x is the random variate, p is the probability and q = 1-p.